Check your Checkout 51 App this week! 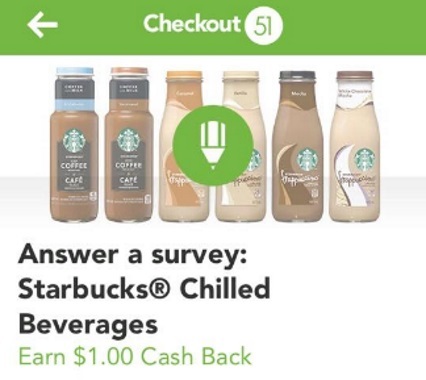 If you purchased and claimed cashback for Starbucks chilled beverages recently you should see a survey for $1 cash back! Click on the survey (it's in with this week's cashback rebate offers) and let them know what you think of this product and you'll get $1 cash back added to your account (will be added in the week). Not a Checkout 51 member yet? Click here to sign up! It's a free and fun cashback program for your mobile, you can earn cash back by claiming offers on groceries that you buy every week. I have redeemed about $60 so far using this app. Click here to see the latest Checkout 51 rebate offers.